The recent conviction of Scott Tucker on numerous federal charges of fraud is not surprising. Auto racing at any level is a great way to blow through copious amounts of money. Wanna launder money? Forget a condo on New York City’s Park Avenue. Go auto racing. The old expression holds true: How fast do you want to go? How much money do you have? The desire to go very fast is what drives criminals and auto racing to occasionally get together. Tucker had previously been convicted of bank fraud. This time around he charged exorbitant interest rates for payday loans and used auto racing to hide his riches from the IRS and bank authorities. Being involved in several high-end racing series at the same time with extravagant cars should have raised eyebrows immediately. Red flag #1. I attended the 2013 Sebring 12 Hour ALMS race just after being Tucker was initially charged with fraud. I came across his Level 5 racing team paddock setup in the paddock. It was truly F1 level in quality, presentation and very costly. Much nicer than the Audi or Corvette factory teams had. Red flag #2. Tucker bumped up the quality of his many race cars with great frequency (HPD at Sebring, top). Not something Roger Penske does. Penske is a businessman. Tucker is a criminal. Red flag #3. Three flags and you go to prison. For a long time. Formula One. Easily the most profligate racing series in the world. Budgets currently go to the hundreds of millions to run at the front. Budgets were always high relative, say, to buying a castle. Sponsors will only kick in so much money, and then the search for more funds kicks in. Some teams bring on wealthy partners to help the funding, others use their businesses to fund their passion. Of course, there’s always the easy way…. David Thiemme and his Essex Overseas Petroleum Company burst onto the sponsor scene in 1979 with Team Lotus. Initially a secondary sponsor, in 1980 Essex became the primary sponsor of the Lotus F1 team. The beautiful metallic blue and chrome color scheme of the cars was matched by the extravagance of the sponsor’s presence at races. From the branded Essex helicopter to the branded Lotus road cars and support vehicles to the over-the-top partying at the races, Thiemme really spared no expense to make his Essex brand very well known. That include sponsoring the factory Porsche 936 effort at LeMans and Mario Andretti at the Indy 500. The party came to an end in early 1981 when Thiemme was arrested on charges of defrauding Swiss banking giant Credit Suisse out of $7.6 million. Essex went under shortly after Thiemme was bailed out of prison. Thiemme then vanished into thin air. Another great-looking car showed up on the grid in 1989. 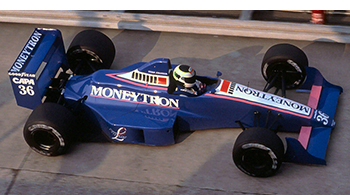 Sponsored by stock-market guru Jean-Pierre Van Rossem’s company Moneytron, the blue, white and pink Onyx team cars showed great promise in the hands of Stefan Johansson and Bertrand Gachot. As the season went on, the red flags went up pretty quickly. Van Rossem pumped money into the team and spoke of investing $40 million into an engine project with Porsche. He managed to collect 108 Ferraris with his wealth in the meantime. But behind the scenes, Van Rossem was already complaining of the high cost of running an F1 team. He considered leaving F1 if the the Porsche deal fell through. He was banned from the paddock after making wildly crude comments about the leaders of the sport. Things quickly fell apart at that point. Team bills fell unpaid and in 1990, investigations into an alleged Ponzi scheme by Van Rossem through Moneytron opened. He was convicted several years later and spent 5 years in prison. He later started a failed political party. Another great way to blow through money…. As good at laundering money as Formula 1 might be, endurance racing might be better. More parts, people and time are required. So is more money. We’ve already spoken about Essex Petroleum and Porsche at LeMans. Now, let’s talk about the American version of that. John Paul and his son John Paul Junior burst onto the IMSA scene in 1975. Initially with a Chevy Monza and Corvette and then with a series of progressively more expensive Porsche 935s, the Pauls would win IMSA races. However, in 1979, federal authorities charged Paul Sr. with marijuana possession and was sentenced to 3 years probation and a small fine. Not satisfied with that, Paul Sr. was later convicted of drug trafficking and attempted murder. He received a 25 year sentence. Paul Jr. received a smaller sentence for helping his father. Paul Sr. later was suspected in the disappearance of his wife, but faded from view and was never charged. He was last seen in Thailand. Early on, Randy Lanier partnered with the Whittington Brothers in IMSA. Lanier later won the IMSA crown with expenses-not-spared March GTP race cars. Lanier later spent several years racing Indy cars with CART as well. The Whittingtons would eventually win LeMans in a Porsche 935 prepared by Kremer Racing. All three spent massive amounts of money on the world auto racing stage. Randy Lanier grew up in Florida, and began selling drugs on the side when he was 15. Purchasing a boat when he was 20, smuggling became part of his gig. As time went on, he grew a fleet of tugboats for smuggling and obtained a partner who owned Apache speedboats. Lanier received a life sentence without parole for his drug importation exploits. The Whittington Brothers were involved in Lanier’s enterprise, and received lighter sentences. Auto racing is hugely expensive. The search for money to run a racing team is eternal and unfortunately, some turn to crime for the source of cash. It never works out well. Proving criminals and auto racing pair well together, until someone goes to prison and the party is over.